It has been estimated that powders account for 80% of materials used in industry. Handling and processing powders, particulates and granules is central to the pharmaceutical industry, but has traditionally been fraught with problems due to their unpredictable and irregular behaviour, specifically with respect to flowability. With so many raw materials, semi-finished and finished products in powder form, pharmaceutical companies stand to gain significant manufacturing and commercial benefits from improvements in the assessment of powder flow. Recent technological developments are now poised to deliver those advantages. Powder handling and processing tends to be problematic because powders exhibit properties similar to both solids and liquids. Normally, they are surrounded by air and the degree of aeration can affect the way the powder behaves. Many common manufacturing problems are attributed to powder flow, including non-uniformity (segregation) in blending, under- or over-dosage, inaccurate filling, obstructions and stoppages. These in turn lead to rejected material, machine downtime and defective end-products. Storage, handling, production, packing, distribution and end use can all be negatively affected by common powder flow problems like those shown in figure 1. Knowing a powder’s characteristics – and the factors which impact on it – is therefore essential. Even the most rudimentary methods of assessing powder flow can be time consuming. However, the benefits of accurately characterizing powder flow measurement can far outweigh this investment of time. Product development teams can evaluate new excipients, active ingredients and formulations, predicting their behaviour prior to commencing large-scale production. They can also check how new powders interact with existing constituents. This speeds up development time and minimizes "trial and error" tactics, especially important when active ingredients are extremely valuable and may have only been produced in small quantities. Predictable powder flow enables constituent selection, manufacturing procedures and equipment to be optimized. This in turn maximizes speed of production, reduces the risk of stoppages and improves blend quality, filling procedures and end product quality. As costs are required to be driven down, the substitution of expensive constituents with lower cost powders is an attractive prospect. Although these substitutes may be produced to the same specification as the original substance, they may not necessarily store, convey and process as easily. Discovering this after production has started would incur downtime and additional cost. Final product quality may also be compromised. The following methods of powder flow assessment are still surprisingly widespread, despite their well-documented shortcomings and recent technological advancement. The sample is poured onto a horizontal surface and the angle of the resulting pyramid is measured. The powder may also be tumbled in a rotating drum to give the dynamic angle of repose. Free-flowing powders will tend to lower angles of repose. The angle of repose is divided by the sample weight to correct for the effects of the powder bulk density. 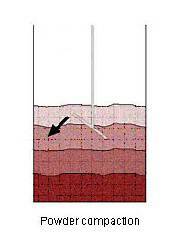 A volume of powder is filled into a graduated glass cylinder and repeatedly tapped for a known duration. The volume of powder after tapping is measured and a calculation performed to calculate the Hausner Ratio or the Carr Index (%). Cohesive powders have a high Hausner Ratio and Carr Index. Given the critical importance of powders to the pharmaceutical industry, these early methods fall drastically short of the standards now required. They are subjective, influenced by the operator and – crucially – any one method is unlikely to be suitable for assessing a broad range of powder flow properties, from free flowing to cohesive powders. But as powder technology advances, particulate properties are constantly evolving. 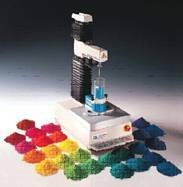 The increasing use of fine powders, for example, which tend to exhibit cohesive properties, means that testing non-free-flowing samples is essential. And for this, instruments are necessary. The first, and most common, instrument for powder flow testing is the Jenike Shear Cell. Powder is loaded into the cell and then compressed with a defined force. After compression, the operator measures the force needed to shear through the sample. This method is commonly used for silo and storage bin design. Shear cell testing requires careful sample loading and conditioning. The analysis of shear cell data is done using Mohr’s circles to evaluate the yield loci and principle stresses. This level of data analysis can be complex and difficult to apply. Moreover, the levels of consolidation load (high) applied to the powder sample may not be representative of the forces experienced by the powder during storage or conveying. This is of great significance for pharmaceutical batch production processes, where only relatively small quantities of powder are stored in bins. Instrument designers have been working to provide accurate, repeatable and objective equipment that can overcome the shortcomings of earlier test methods. One such instrument is the Powder Flow Analyser by Stable Micro Systems and supplied by Arrow Scientific (photo 1). One of the major factors behind the most recent developments was the need for testing in environments that were as close as possible to actual processing conditions. Manufacturers are aware that some of the most common powder handling problems arise when conveying from storage silos or bins into production. 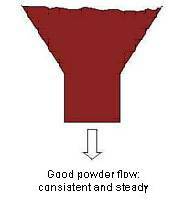 Often the powder will have been motionless for hours, days, or even weeks before flow is required. Over this time, most powders will compact with the result that far more energy is needed to cause flow than in aerated samples. On the other hand, powders used immediately after transport, which may have involved agitation or more pronounced vibration, will have been aerated and flow more easily than others that have been stored. Purging and air permeation systems, installed to aid flow, will naturally impact on the behavior of a stored powder. For this reason, it can be desirable to condition the sample prior to testing. The latest powder flow analyzers are able to compact or aerate samples – this not only reflects real storage conditions, but reduces any interference caused by the loading of the sample. The test itself, and subsequent data acquisition, begins after conditioning is complete. 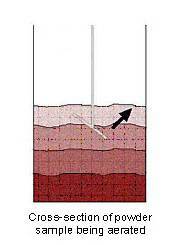 Compaction or aeration of a powder sample using a ‘conditioning cycle’ will remove stress history from the powder. However, this stress history may be of interest when testing ‘as delivered’ or newly manufactured powders. Software interfaces allow modifications to the test sequence to be made, so when stress history is of interest the conditioning cycles can be removed from the start of the test. As modern powder testing equipment causes the sample to flow (rather than relying on its own ability to do so), users are able to define how it should flow. Movement of the sample is caused by a blade or rotor, which is passed through the powder according to settings defined by the user – both moving vertically and rotating. As testing is done on a relatively small scale, the design of both the sample vessel and the blade is critical. Manufacture of these components must be of the highest quality – any blemishes on surfaces, incorrect angles or imperfect edges would impact on the flow of the sample, and the results of the test. When the blade is rotated in the direction shown in figure 4, the sample is lifted or aerated. This procedure conditions the powder and eliminates any loading variation. After compaction, it can measure the level of particle cohesion, flow and recovery. Figure 5 shows compaction. It provides a simple quality control test for variations between batches and/or sources. Samples being compacted will resist flow and movement. Slice compaction, shown in figure 6, can be used to blend and mix samples. This procedure removes air from the sample and causes friction between the surfaces of granules. Users can assess the smoothness of the contact between the powder and the blade. These movements can be carried out in any combination and in any sequence. 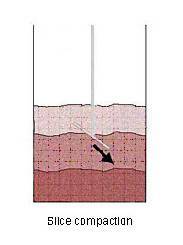 A simple test will involve (i) conditioning, (ii) slice compaction and slice aeration (typically repeated five times), and (iii) blade shake, to remove any powder which has adhered to the upper blade surfaces. However, sophisticated instruments can be programmed to carry out far more complex tests over prolonged periods. During testing, software gathers data relating to time, axial force and distance. Accuracy is optimized if this information is measured at 500 pps (points per second) or more. Instruments like Stable Micro Systems’ Powder Flow Analyser can interpret and display this information in real time, as well as perform composite or statistical calculations. Tests on different samples, and tests conducted under differing conditions, can quickly and simply be compared to allow the grading and ranking of powders. Being able to measure powder flow is of prime importance to manufacturers, but as quality standards continue to rise, few can afford to stop there. Finished product testing is essential to ensure correct performance and safeguard reputation, sales and market share. By using a modern powder flow analyzer, manufacturers are able to change attachments on the instrument for testing semi-finished and finished products as well. This offers considerable financial savings, as well as simplifying training and releasing valuable lab space. Many have legacy systems to analyze properties such as tablet hardness, tablet coating adhesion, gelatin capsule strength, diametrical tablet compression and granule friability (compression), among others. Powder flow analysis is extremely valuable in the pharmaceutical industry, as well as in many others. Objective and repeatable testing combined with ranking of dry powder samples can provide significant opportunities and benefits. These include optimizing batch and source selection in terms of cost and quality; the development of best mix formulations; optimizing scaling up and process conditions; and maintaining product quality control. Innovative technology provides such data either by measuring and comparing products capable of flow, or by assessing sample behavior under test conditions simulating in-process or product handling conditions. Best-practice raw material purchasing, processing efficiency, waste minimization and product quality – before and after storage, packing and transportation – are all desirable for manufacturers. The application of practical powder rheology will be a valuable tool for achieving these goals.